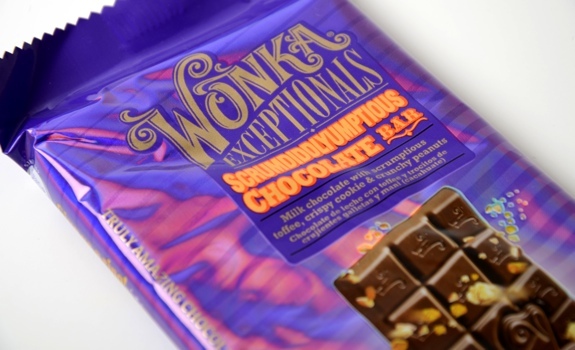 The Wonka Exceptionals Scrumdiddlyumptious chocolate bar, wrapped in shiny purple packaging. The Look: Shiny purple packaging! The vibe is old-timey and magical — it looks like a snack that might be available from the train concession cart on the long ride to Hogwarts. 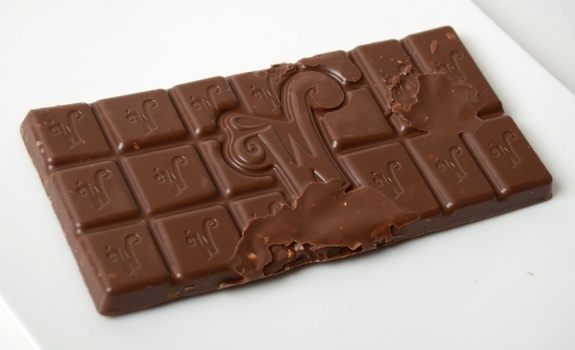 The chocolate bar itself has a big curly W on it, and is divided into pieces of unequal size (how curious). The bar partially melted on the road trip back to NEAROF! HQ, so that’s why it looks strange in the photos. The Taste: A very sweet milk chocolate, with lots of crunch and scratchy texture coming from the toffee, cookies and peanuts. The peanut is the most dominant of the three additions, which is fine by me. The more of the bar I eat, the more I think it may be too sweet for some people. While I don’t mind the sweetness, I couldn’t see eating the whole bar in one sitting. Even half would be a bit much. Yeah, it's kind of melted. Sorry. It endured a sunny road trip from the U.S. to make it to NEAROF! HQ. Still, that's a cool W on there, eh? Cost: $1.99 for a 99.2 gram (3.5 oz.) bar at QFC in Seattle. Gifted to NEAROF! Value for cash money: That’s a good price for a large chocolate bar. Availability: U.S.A. I don’t think I’ve seen it in Canada before, but I could be wrong. Nutrition? : Per 33 grams (1/3 of the bar): 170 calories, 10 grams of fat, 35 mg of sodium, 2 grams of protein. Stick to the portion (maybe share it with two friends? ), and you can limit the caloric damage. The verdict: I like it, but I wouldn’t eat it regularly. 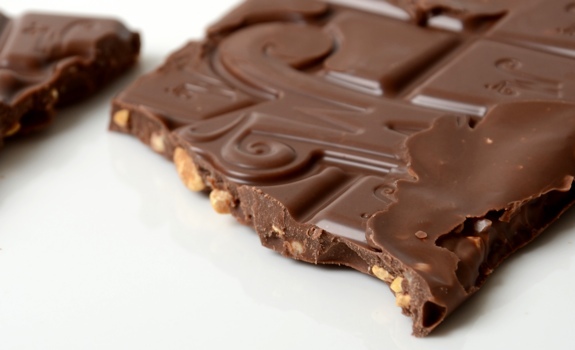 The chocolate is sweet and rich, and the chunks added to the chocolate bring something extra to the bar. Peanuts! They're buried in the chocolate! The Willy Wonka bars are available at a candy store in SW Calgary, next to Glamorgan Bakery, for around $6 each.